King Harald of Norway granted today the President of Palau, Tommy Remengesau, an audience at the Royal Palace in Oslo. According to Royal Court's information department, the news/photo agency NTB Scanpix took photos at the event, but as far as I know no newspapers or other media have published them, and I am not willing to pay a large fee in order to publish a photo on my blog. No published photo from the historical event is a pity, I think, as it is not every day King Harald meets a head-of-state from such a far-away country. * There is at present no information about the visit at the president's own Twitter account or the official website of the Government of Palau. But according to the Norwegian Foreign Office, President Remengesau is in Norway in connection with a summit on illegal fishing. The president spoke at the summit yesterday, as is shown in tweets from the UN Food & Agriculture Organization's Fisheries & Aquaculture Department and Christian Laborda, former Head of Oceanic Dpt. MOFA Chile (see here and here). There is even a photo of President Remengesau together with the Norwegian Minister of Fisheries, Per Sandberg (Árni M. Mathiesen, Assistant Director-General, Fisheries and Aquaculture Department FAO, is also in the photo). So what is to tell about President Thomas E. «Tommy» Remengesau? According to the official website he is in his fourth period as President. He was Vice President of Palau from 1993 to 2001, then President from 2001 to 2009 and after a break, because in accordance with the Constitution of Palau one cannot be elected for more than two consecutive periods, he regained the top position in 2013. The president, who is born in 1956, is married and has four children and five grandchildren. His father, Thomas O. Remengesau, b. 1929, served as acting President of Palau in 1985 (then in the capacity as Minister of Justice as the Vice President was abroad and had to return to take the oath) and as President from 1988 to 1989 and was the country's Vice President from 1985 to 1988. The short presidential history of Palau is kind of brutal. The first president, Haruo Remeliik, was assassinated in 1985, while the third president, Lazarus Salii, commited suicide in 1988. The Danish Royal Court annunced today that HSH Princess Alexandra of Sayn-Wittgenstein-Berleburg and her husband Count Jefferson-Friedrich von Pfeil und Klein-Ellguth have decided to divorce. Princess Alexandra is the second child and eldest daughter of the late Prince Richard of Sayn-Wittgenstein-Berleburg and Princess Benedikte of Denmark. Princess Alexandra married Count Jefferson at Gråsten Palace on 6 June 1998. They have two children together, Friedrich, b. 1999 and Ingrid, b. 2003. For the last three years the couple has lived in Germany. The couple has not yet made a final decision about where they will settle in the future, but the children will continue at their school in Schleswig-Holstein. Emmanuel Macron, who was elected President of France last Sunday, 7 May 2017, was installed as the new president in a ceremony at Élysée Palace in Paris today. At the same time Macron became the new Co-Prince of Andorra. I have therefore updated my Longest reigns website accordingly. The funeral service for Baron Niclas Silfverschiöld, who died on 11 April 2017, 82 years old, took place today at Erska Church at Sollebrunn in Alingsås municipality. Attending the service were of course the late baron's widow Princess Désirée, Baroness Silfverschiöld and her immediate family. King Carl Gustaf, Queen Silvia, Crown Princess Victoria, Prince Daniel, Prince Carl Philip and Princess Sofia came directly from the celebrations in Oslo, and they were accompanied by Princess Märtha Louise, who represented the Norwegian royal house. The Swedish Princesses Margaretha, Mrs. Ambler, Princess Birgitta and Princess Christina, Mrs. Magnuson and her husband Tord Magnuson and other family members were also present for the funeral service. According to Svensk Damtidning, the Danish Royal House was represented by Princess Benedikte. Princess Madeleine and her husband Chris O'Neill are currently in Florida, USA, and where thus unable to attend. After the funeral service a reception took place at Koberg Palace. So far it has not been revealed where Baron Niclas Silfverschiöld will be buried. One possibility is the Royal Burial Ground at Haga outside Stockholm. Another possibility is the Silfverschiöld family grave in Sahlgrenska gravkoret (the Sahlgren Grave Chapel) at Tölö Cemetery at Kungsbacka south of Gothenburg. Svensk Damtidning seems to suggest the latter in an article published today: «De närmaste fortsatte sedan till familjegraven för gravsättningen och just nu pågår mottagningen hemma hos familjen Silfverschiöld på Koberg.» («The closest [family members] continued to the family grave for the funeral and just now a reception is taking place at the Silfverschiöld's home at Koberg.») It takes about 1 hour and 10 minutes from Sollebrunn to Kungsbacka. Updated on Thursday 11 May 2017 at 21:25 (more people in attendance were added, as well as information about the burial place). The official celebrations of the King and Queen of Norway, who both turn 80 this year, take place on Tuesday 9th and Wednesday 10th of May 2017. The celebrations include among others a gala banquet at the Royal Palace on Tuesday evening, a cruise with the royal yacht on Wednesday and the Norwegian Government's dinner at the Opera House on Wednesday evening. All in all 183 guests were present at the Royal Palace on Tuesday. When the royals greeted the people from the balcony, all the grandchildren of the king and queen were present - Princess Ingrid Alexandra, Prince Sverre Magnus, Maud Angelica Behn, Leah Isadora Behn and Emma Tallulah Behn. They were also included in the official photo which was published on Tuesday night. In addition to the royals and dignitaries above also representatives of the official Norway were present, and surely also other family members of the king and queen. I wasn't able to watch TV when the guests arrived, so I am not able to give more details at present. Further details about the celebrations can be found at the official website. For photos of some of the guests, go here. Updated on Wednesday 10 May 2017 at 00:05 (one link replaced). 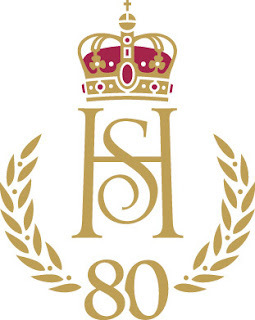 King Harald turned 80 years old on 21 February, while Queen Sonja will be 80 on 4 July. Next week the official celebrations will take place with royal guests expected from all corners of Europe. 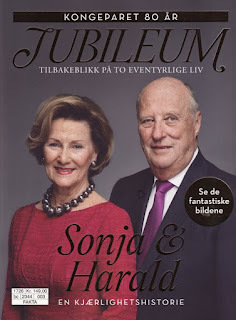 in connection with the anniversary Aller Forlag has published a jubilee book titled Sonja & Harald. En kjærlighetshistorie («Sonja & Harald. A Love Story») (2017; ISBN: 9788232503223, softcover, 115 pages). The book costs NOK 149 (USD 17,19/Euro 15,68/GBP 13,28). The editor is Caroline Vagle, who is a royal reporter for the bi-weekly magazine Se og Hør. First of all it is a «table book» filled with great photos from a long public life together. I will report back if I come across any other similar jubilee books. Photo: 2015 Aaron McCracken / Harrisons. Wikimedia Commons. Yesterday morning I woke up to the news (*) that «The Queen's entire household [had been] called to Buckingham Palace for [an] 'highly unusual' emergency meeting» and rumours were circulating that a member of the royal family had died, with Prince Philip's name being mentioned more than others. 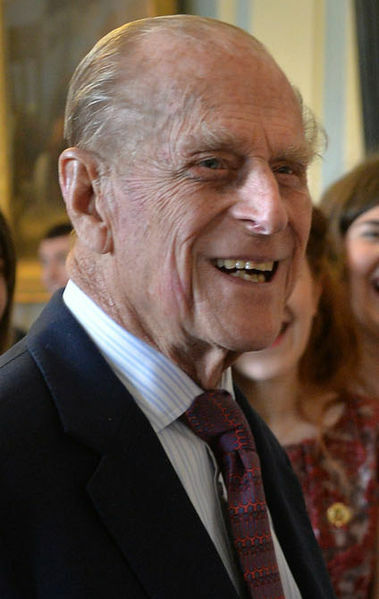 The Sun even managed to report that Prince Philip had died. Soon it fortunately turned out that there was nothing extraordinary about the staff meeting, and that the senior royals were all well. (*) The link goes to a Daily Mail article which was updated several times after the tweet was posted. Formannens spalte: Hvor blir det av kildekritikken? I tillegg finner man referater, årsberetning for Norsk Slektshistorisk Forening 2016, regnskap m.m. Blant foreningsstoffet finner man også min lille oppsummering kalt «Status for Slektshistoriewiki» per midten av mars 2017. Selve wikien finner du her. Formannen nevnt over er Rune Nedrud, som også er hovedredaktør for medlemsbladet. Nytt av året er at forfatterne av slektsartiklene har fått egne presentasjoner på samme måte som i Norsk Slektshistorisk Tidsskrift. Det synes jeg var en god idé. Hvorfor Audun Lem ikke kom med i presentasjonen, vet jeg ikke. Jeg har selv vært medlem i redaksjonen siden 2010, men har først og fremst beskjeftiget meg med korrekturlesing og har ikke hatt noe innflytelse på innholdet ellers, bortsett fra artiklene og annet stoff som jeg selv har bidratt med. Petter Vennemoe er heller ikke presentert, men hans bidrag denne gangen er en rettelse til artikkelen av samme navn i Genealogen nr. 2, 2016. Vennemoe var for øvrig bidragsyter til NSFs store prosjekt Eidsvollsmennene – Hvem var de? fra 2014, og man finner en presentasjon av ham der på side 274. Ole Arild Vesthagen er en erfaren slektsforsker kjent blant annet for nettstedet Oavesthagen.no (Ole Arilds slektssider). Jan Christensen har drevet nettstedet Skien Genealogiske Side siden 1995. Elin Galtung Lihaug har sittet en årrekke som styremedlem i NSF og har blant annet vært redaktør for antologien Genealogica & Heraldica. Influence on Genealogy and Heraldry of Major Events in the History of a Nation. Proceedings of the XXXIst International Congress of Genealogical and Heraldic Sciences. Oslo 2014. Svein Henrik Pedersen er historiker og medforfatter av firebindsverket Orkdalshistoria og for tiden medforfatter av Fosens historie, bind 2. Mitt hovedbidrag denne gangen er altså artikkelen Brødrene Rosenbaum som tok slektsnavnet Rogg. Som tittelen antyder, så omhandler artikkelen brødrene Halvard, Karl Marius «Kalle» og Henry Conrad Rosenbaum, som i 1939 fikk Justisdepartementets bevilling til å anta slektsnavnet Rogg. I artikkelen fortalte jeg litt om hva som motiverte ønsket om navneskiftet og litt om navnebevillinger som kilde. I tillegg skrev jeg en liten presentasjon av de tre brødrene samt en kort genealogisk oversikt over de tre brødrene og deres nærmeste slektskrets, som inkluderte to halvsøstre, en antatt halvbror samt brødrenes foreldre Henry Conrad Rosenbaum (d.e.) (1878–1949) og Harriet Kristensen (1881–1965). Jeg kom ikke helt i mål med genealogien – det var fortsatt noen uavklarte spørsmål som stod igjen ved deadline. Det skyldtes delvis at jeg kom litt for sent i gang med prosjektet (og det var jo navnebevillingen jeg først og fremst hadde tenkt å fokusere på), og delvis at jeg ikke var kreativ nok i letingen etter kilder. Etter at jeg leverte artikkelen, har jeg funnet ytterligere informasjon om slektskretsen, og som både utfyller og korrigerer artikkelen, så jeg håper jeg kan komme tilbake med en kort oppfølgerartikkel i neste utgave av Genealogen. Blant de nye funnene er at jeg har funnet både fødselsattesten til brødrenes far Henry Conrad (d.e. ), som ble født i Edinburgh i Skottland i 1878, samt vielsesattesten til Henry Conrads foreldre Adolf (Adolph) Rosenbaum og Helle Johanne Nilsen. Dermed har jeg også navnet på Adolfs foreldre. Videre har jeg funnet korrekt fødested og fødselsår for Halvards kone Mary Alice. Dessuten har jeg funnet flere detaljer om den antatte halvbrorens mor, slik at det er mulig å avgrense letingen etter halvbroren til en kortere periode. Jeg har kommet over mer informasjon om halvsøsteren Constanse (Henry Conrads datter fra første ekteskap) i USA. Kanskje kan denne informasjonen lede til en løsning på spørsmålet om hvor det ble av Adolf og Johanne i USA? Jeg har dog foreløbig ikke funnet ut noe mer om halvsøsteren Magdalena Henriette, f. 1909, etter at hun giftet seg i 1928. Jeg jobber videre med alle de uavklarte spørsmålene, og håper som sagt å komme tilbake med en oppfølgerartikkel senere. Forhåpentligvis vil artikkelen i herværende utgave også føre til tips fra leserne? Short English summary: This blog article is about the latest issue of Genealogen (no. 1, 2017), the newsletter of the Norwegian Genealogical Society. In addition to a presentation of the main articles, I give some details about my own contribution, Brødrene Rosenbaum som tok slektsnavnet Rogg («The Rosenbaum brothers who took the surname Rogg»), and new findings which will hopefully lead to another article about the Rosenbaum-Rogg family.